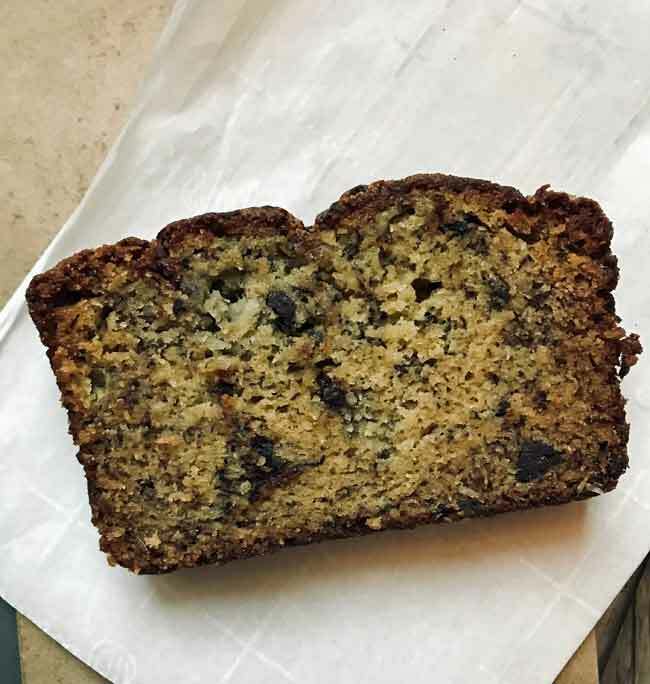 I’m mad at myself for not coming up with the idea to put pudding mix in banana bread, but thankfully someone did and Chrissy Teigen was smart enough to include a recipe for it in her second book, Cravings: Hungry for More. I haven’t bought her second book because I’m still reading her first, but Chrissy Teigen’s banana bread recipe is making its rounds on the Internet if you need the original. This version is a little different, hence the name Not Quite Chrissy Teigen’s Banana Bread. I scaled it down by 1/4, used the same technique as the Almond Crunch Brown Butter Banana Bread, baked it in a large loaf pan and adjusted the time. Looking at this loaf it’s easy to see why Chrissy uses the Bundt pan. But looks aside it’s a really good banana bread recipe that people who are into dense, chocolate filled banana breads will love. It’s on the sweet side, so definitely add the unsweetened coconut (it is not overpowering at all) to help cut the sweetness a bit. If you just cut the sugar you’ll most likely change the texture. If you want to make it as loaves but don’t want to scale it down, you can make Chrissy Teigen’s original recipe as two 8×4 inch loaves. In the book she notes that making it as small loaves works, but they aren’t as moist as one big Bundt. Based on how moist this one is, I don’t think that will be a problem. Chrissy Teigen’s Banana Bread scaled down a little and baked in a loaf pan. Preheat oven to 325 degrees F. Grease and flour a 9 ½ x 5 ½ inch loaf pan. If you are worried about the bread sticking, grease the pan and line with a strip of parchment. Flour sides. Combine the mashed bananas and the eggs in a large bowl and set aside. In a second large mixing bowl, mix together the flour, sugar, instant pudding mix, baking soda,and salt. Make sure to mix it very, very well. Add the mashed banana mixture to the dry mixture and stir until thoroughly blended. Pour the oil over the batter and mix with a heavy duty scraper until blended. Empty batter into the loaf pan and bake at 325 for about an hour and 15 minutes (check at an hour). Let cool for an hour or so. Linda, thanks for the nice comments and feel free to ask questions or give some advice any time. I love chatting with other bakers. Hope the loaves taste as good as they look. Per your request, I’m updating. I decided the height and density might be hard at 325 with two loaves in the oven but I did tent the loaves the last 15 minutes or so to insure they didn’t get too dark and overdone. They are beautiful loaves so I guess you could go with either temperature but 325 probably keeps the loaves safer from getting too brown and save you having to tent. I baked my two loaves around 75 minutes at 350. I’m not sure I have commented here before but I really enjoy your site and love nearly all the dessert recipes (I am more baker than cook) and appreciate your comments and thoughts in the blogs. Thanks!! Linda, that’s a great question because in a lot of recipes I crank up the heat when I preheat and then turn the heat down. In this case I just baked it at 325 and probably wrote 350 out of habit. I’ll fix that right now. If you get a chance, please check back and let us know how it turned out. I’m not clear on why the oven is preheated to 350 but then you indicate baking at 325. Was that a typo or did you mean to indicate the temperature should start at 350 and go down at some point or you were just heating the oven hotter but wanted to bake at 325? Not really clear in the recipe. I’m doubling the recipe into two loaves. I’ll let you know how well they are received. The recipe sounds great and I had some bananas to use up and went with two loaves to use more than the 12 oz. noted. Thanks! Glad you made it, Stephanie. The browned butter one is definitely less sweeter. 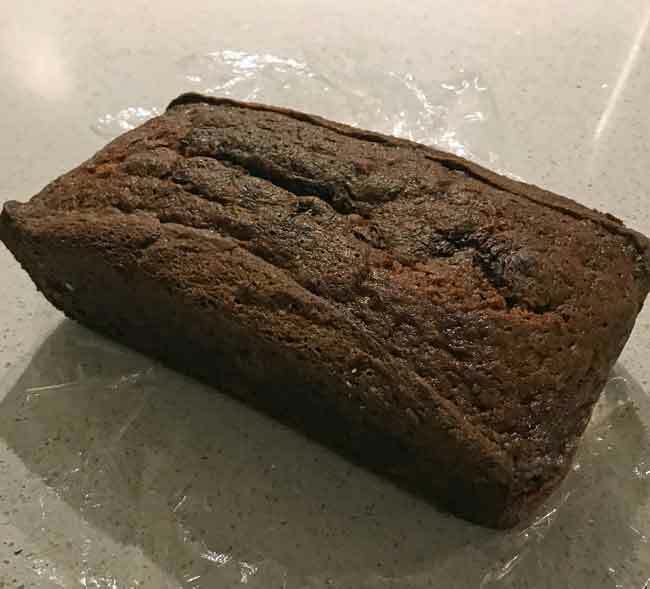 The other ones I like best are the Starbucks Banana Bread, Best Ever Banana Bread and this one which always rises high and is very moist but not super sweet. I made this recipe when I probably should’ve made the browned butter one. I think this one was just easier for me to get in the oven on a busy evening. It is not bad but it definitely is sweeter than I would’ve liked. My favourite is still the Gale Gand Whole Wheat Chocolate Chunk recipe. I hate banana bread but I don’t mind eating that one. I’ll try the browned butter one next – I gotta get rid of all these bananas. Stephanie, the old me would have said that. The new 2019 me is not apologizing for banana bread recipes. Karen, I think it would be fine. If you try it without the chocolate, let us know how it is. Anna, how would this be without the chocolate? Would I need to make any adjustments? Sue, this recipe is definitely dessert-like. No surprise there! The one with chocolate that I like is this one (link below) because it’s not quite as sweet, has a little whole wheat and feels more breakfast–ish. But this pudding mix one could be dessert. The last time I made banana bread with chocolate in it the taste was great but was more like dessert. That isn’t a bad thing. Sweetness wise this sounds similar. This reminds me. We’re out of bananas.